Commended for its iconic architecture, innovative planning and design, sustainability and revolutionary vertical village office layout, 8 Chifley sets the benchmark for future CBD office developments. “Construction of 8 Chifley began without a major tenant on board presenting both a challenge and an opportunity,” said Mr Healy. When anchor tenant and law firm Corrs Chambers Westgarth signed an agreement to lease 42 per cent of the building, Mirvac’s project team quickly mobilised a building design amendment to accommodate changes to suit the tenant’s requirements. Significant planning, procurement and design changes were required to meet the tenant’s brief for a workplace that would drive cultural change and these were achieved with no impact on the sustainability and functionality of the architectural concept, nor to the delivery program. “The success of this building can be measured by its financial performance - it is 97 per cent let -along with its high level of sustainability and end user satisfaction,” said Mr Healy. The building’s distinctive red sway frames or “braces” provide lateral support to the building, preventing the core from twisting. This design feature in turn made it possible to devote 70 per cent of the ground plane to the public with a plaza and cafe accessible to building users and the wider community. Other aspects of the buildings striking architecture include the 6 level reverse podium, the trademark ‘Rogers’ external fire stairs and the horizontal roof top feature. From a sustainability perspective 8 Chifley is one of only a few commercial buildings in Australia to achieve a 6 Star Green Star design rating which entitles the classification rating of “World Leadership” in environmentally sustainable design. The building has been fitted with a tri-generation plant which was upsized in order to export excess power produced to the grid and power other company assets. Also incorporated into the design is a black water treatment plant with sewer mining capabilities, reducing the use of potable water and minimising the output of waste into the sewer. The design also includes a naturally ventilated glass lobby box, fixed sun shading and 130 bicycle spaces and lockers. 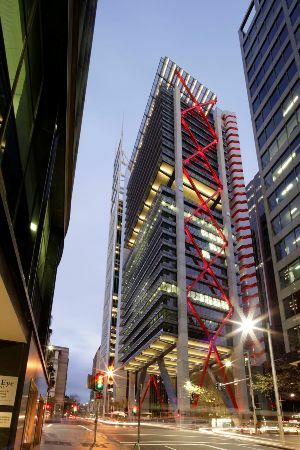 A step beyond any other commercial building in Australia, 8 Chifley brought to life the vision of internationally renowned architect Richard Rogers of Rogers Stirk Harbour + Partners together with Lippmann Partnership. As owner, developer and builder, Mirvac leveraged the opportunity to highlight the capabilities of its integrated model. “A design competition which brought together both local and international design concepts produced a unique and innovative design but there were many technical and construction challenges that had to be overcome to deliver that vision,” said Mr Healy. The 145 metre tower began construction in September 2010 and was completed in July 2013, two months ahead of schedule.